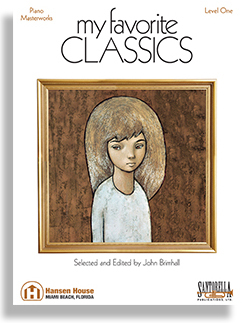 As we considered republishing and updating the industry standard My Favorite Classics series, it was clear that while we knew that each edition would need a fresh, but familiar look, we also realized that we needed to preserve the original integrity of each book, including the author's deliberate selection of pieces, and thoughtful editing and fingerings. After all, classics are classics for good reason. We think you'll agree that the newly updated 21st Century version of My Favorite Classics will remain the go-to industry standard for many more generations to come. Level One, the first book in the series is an extensive collection of 72 of the world's most favorite and most loved easy piano classics, written by composers spanning the important classical music periods from the early Baroque to the Twentieth Century. Each piece is presented as originally written by the composer, without alteration, and arranged within the book in approximate order of difficulty from grade 1 to grade 3 in the piano grading system. My Favorite Classics exposes the early piano student to one of the widest variety of pieces and composers available in print today, both familiar and not so familiar. From Bach to Bartók, Mozart to MacDowell, Schumann to Stravinsky, and Purcell to Prokofiev, the selections within not only serve to develop the skills necessary to play a wide variety of musical styles, but also serve as a valuable music education enabling the student to become familiar with specific sounds and pieces attributable to each composer and each of the major music periods. Byrd: A Gigg - Chambonnieres: Sarabande ("Jeunes Zéphirs") - Couperin: Canaries Buxtehude: Sarabande (From, Suite on the Chorale, "Auf meinen lieben Gott") Krieger: Minuet in G – Corelli: Sarabande – Purcell: A Ground in Gamut, Old Dance Tune, Prelude – Rameau: Le Tambourin, Minuet for Clavichord – J.S. Bach: Little Prelude in C, March (From the Notebook for Anna Magdalena Bach), Minuet (From the Notebook for Anna Magdalena Bach), Minuet in G, Musette (From the Notebook for Anna Magdalena Bach) – Handel: Courante in F Major, Gavotte, Minuet in F, Sarabande – C.P.E. Bach: Minuet in Eb - L. Mozart: Minuet in C – Haydn: Allegro (From “Sonata in G”), Arietta, Easy Divertimento – Clementi: Sonatina in C (Op. 36, No. 1), Sonatina in G (Op. 36, No. 2) – W.A. Mozart: Andante, Minuet in F (K.5), Minuet No. 1, Presto – Duxxek: Polonaise Beethoven: Merry and Sad, Romanze, Russian Folk Song, Six Variations on a Swiss Air, Sonatina in G – Diabelli: Siciliano – Czerny: The Fair Beyer: Mountain Song – Burgmuller: Arabesque, Ballade – Schumann: Melody (Op. 68, No. 1), Soldier’s March, The Happy Farmer (Op. 68, No. 10), The Wild Horseman Berens: The Music Box (Op. 50, No. 17), Baumfelder: Melody MacDowell: A Deserted Farm (Op. 51, No. 8), To a Wild Rose Gretchaninoff: Mama, Swing Song – Rebikoff: The Organ Grinder – Stravinsky: Larghetto (From, “Seven Pieces on Five Notes”), Walking Song (From, “Seven Pieces on Five Notes”) – Bartok: Folk Song, Humming Along, Peasant Song, The Lost Doll, Vagabond’s Song – Prokoviev: March (Op. 65, No. 10), Moonlight Meadows (Op. 65, No. 12), Parade of the Grasshoppers (Op. 65, No. 7), Promenade (Op. 65, No. 2) - Khachaturian: Loneliness – Kabalevsky: A Game, A Little Song (Op. 27, No. 1), Sonatina, The Clown, Toccatina (Op. 27, No. 7), Shostakovich: Fairy Tale (From, “Six Children’s Pieces”), March (From, “Six Children’s Pieces”).